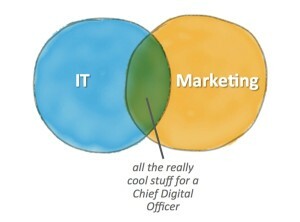 So what does a CDO do? The role of the CDO in the enterprise has gotten a great deal of attention in recent months. Perhaps because of the impact and influence that the CDO had in the Obama campaign last fall. All the tools of the trade – text analytics, social media analysis, Website personalization, community analytics, computational advertising and online testing, among other things – were used for re-elect the President of the United States. In this new Age of the Customer (credit to Forrester for naming this one), how well a company uses the readily available information about their customer will determine how successful they are in the marketplace. Which is no small feat since most companies are not “born digital” there is a lot of work to do to get all the people, process and technology to line up. Adapting to the Age of the Customer requires a new skill set that existing leadership teams don’t necessarily possess. At many modern companies, it’s hard to find anything that is not related to technology in some way. Moreover, marketing has become so deeply entwined with technology. But this didn’t happen to us overnight; it’s been sneaking up on us for a while. But because technology had been so tangential to marketing management for most of our history, the organizational structure of marketing has been slow to adjust to this new technology-centric reality. But we’ve clearly reached a tipping point. To fully reap the benefits marketing must officially take ownership of its technology platforms and strategies. I also like to think the traditional path that the CMO has taken to get into the C Suite is changing. Typically the modern day CMO takes Marketing 101 in college, gets a Masters in Marketing, works for a major brand like P&G as an entry level marketer, becomes a brand manager then rises up to eventually become the CMO. Well today’s marketers are growing up digital – they create aps, they place Facebook ads, they run some mobile ads and design augmented reality games – all before lunch! Its no wonder why the idea of a CDO has emerged – because it didn’t make sense for many organizations five years ago, it’s hard to imagine that major companies won’t be operating without one in the very near future. So how are you preparing for this new reality? In this new era, business models cannot be limited to what legacy IT is able to support. Instead, all business systems, including monetization platforms, must adapt to deliver the experiences customers want. Like it or not, what Andrew McAfee predicted in 2006 in his book, Enterprise 2.0, is here, it’s happening and whether we call it “enterprise social,” or “social business” or just the biggest communications revolution since the printing press, it’s changing the way we do business in a fundamental fashion. So I suggest the best way to prepare for this is to join me in attending the The Social-Shake-Up Conference. This is not your ordinary conference about social media. Nor is it a conference about advertising or marketing technologies. It’s meant to prepare you for changes that are occurring and give you what you need to succeed in this new era. The conference is a jam-packed two-and-a-half days from September 15-17 in Atlanta with 5 tracks ranging from Big Data, Mobile, Social Organization, Customer and Community as well as Content. I hope to see you there! “@PaulDunay: The Social-Shake-Up: A New Breed of Marketer is Coming http://t.co/habx0bBALu” great piece Paul!